Well, this might sound crazy, but that all depends on the job you’re doing. The first step in choosing a respirator and cartridge is having a complete hazard assessment performed. OSHA standards 1910.134 and 1926.103 require that you wear a respirator if you work with any of these hazards: insufficient oxygen, harmful dusts, fogs, smokes, chemicals, mists, fumes, gases, vapors, sprays, biological hazards, or silica. Phew, that was a mouthful. These are important things for workers and safety managers to know, right? It’s also important to know that respiratory protection isn’t one-size-fits-all. One of the worst things you can do is wear a respirator with the wrong cartridge. Talk about a false sense of security. The truth is that there’s a science behind choosing the right cartridge. They’re designed to filter out specific contaminants so that you can breathe safely. Typically, filters protect against particulates and cartridges protect against gas and vapors. Sound complicated? Take a deep breath. There’s good news. Manufacturers have made it easy to choose a respirator cartridge that will protect you. A color coded chart removes the confusion that usually surrounds respiratory protection. There’s a color code on the cartridge or canister that tells you what it protects you from. 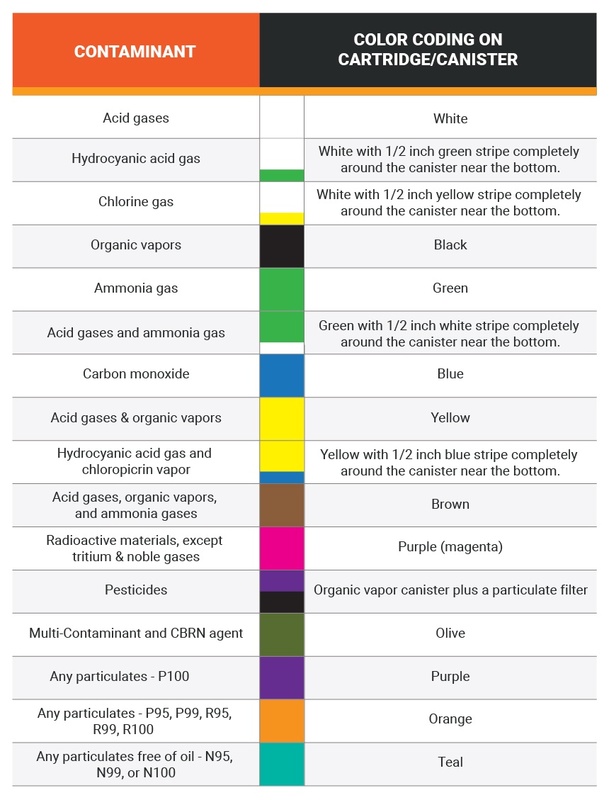 Acid gas, chlorine gas, organic vapors, carbon monoxide and particulates all have a specific color. There’s a reason for this. NIOSH determines the safe levels of contaminants that you can inhale. Different materials and different levels of protection are required for each contaminant. These levels depend on the Assigned Protection Factor (level of protection that a respirator is expected to provide) and the Permissible Exposure Limits (how much you can safely be exposed to) for a particular contaminant. It’s usually measured in parts per million (PPM) over an eight hour shift. None of this matters if the respirator doesn’t fit you. Think about it. You spend time and money finding the right equipment to protect your lungs and then fail to check for proper fit. Sounds like a massive waste of time. Tight-fitting respirators should be fit-tested at least once a year or any time there is a change in weight, scarring, facial hair, new eyewear, or surgery. Whether you choose a qualitative test (relies on a person’s senses) or a quantitative test (doesn’t rely on senses) is preference. The important thing is that one is performed to catch even the smallest break in the seal or damage to the respirator. Don’t rely on a user seal check. Remember that every piece of PPE has specific job to do. Safety equipment doesn’t have to be complicated; you just need the right advice.